Saltimbocca has become somewhat of a classic. Originally Mediterranean, the name Saltimbocca is Italian for “jump in mouth” – a reference to the flavor explosion that takes place while eating this dish. There are varying ways to make saltimbocca. 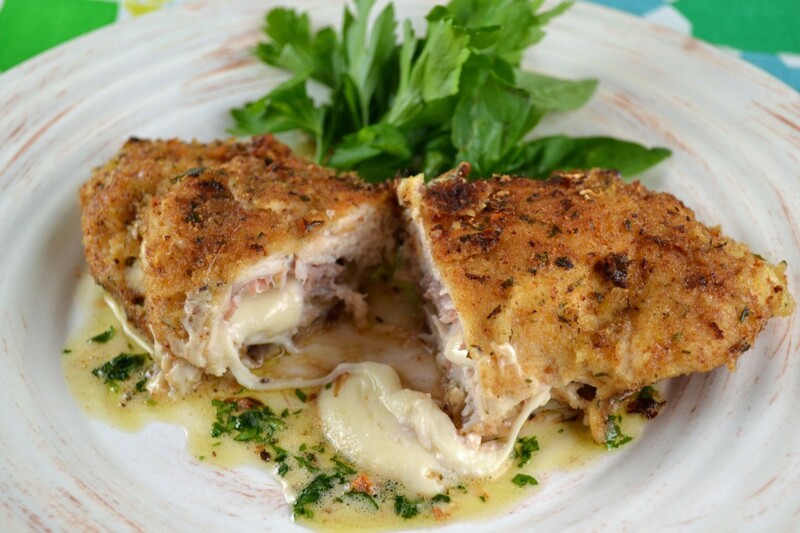 Veal, sage, capers, and sometimes provolone cheese are common ingredients. However, in each scenario the basics remain the same: the chicken or veal is sautéed and prosciutto is always involved (though I see no reason why you couldn’t use ham for a less expensive version). 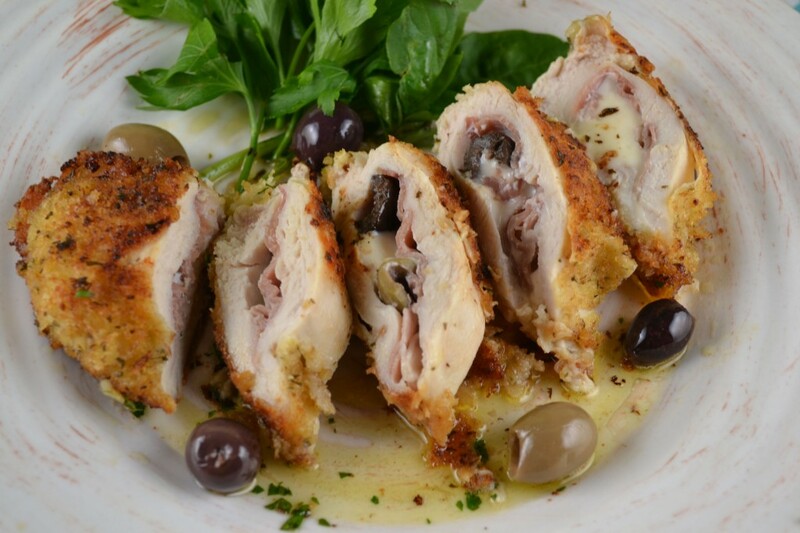 This recipe for Chicken Saltimbocca from “The Art of Good Cooking” happens to include black olives, which is somewhat rare but the beauty of this dish is its flexibility. Though I didn’t add it here, I think roasted red pepper could also make a nice addition to the center filling. The mozzarella is a natural match with the prosciutto and the crunchiness of the breading that soaks up some of the garlic butter is a combination that’s worth it alone – the other ingredients are just a bonus! Note: the original recipe did not include toothpicks. I find that it’s easier to ensure the filling stays between the two cutlets by securing each package with a couple of toothpicks. Just make sure to take them out after cooking! On one side of each breast or cutlet, place a piece of prosciutto, a piece of mozzarella, and two olive halves. Sprinkle with freshly ground pepper. Fold unfilled side over to cover filling, and press edges firmly together to enclose filling or secure with toothpicks. Flour each package so it is dusted on all sides. Beat egg slightly, adding milk. Dip chicken packages into mixture on both sides. Then dip into bread crumbs. Chill for at least a ½ hour or longer. Melt ¼ cup butter in a small saucepan. Add half the chopped garlic and parsley. Keep warm until chicken is cooked. Heat butter and olive oil in skillet with remaining garlic and parsley until fats are hot but not smoking. Place breaded chicken in skillet and turn heat to medium high. Saute chicken quickly, only until golden. Turn once to cook the other side. Remove to heated serving dish. Remove toothpicks, if using. Pour warm garlic parsley butter on top.